It’s been a busy week in the Capitol as things really get underway. There are literally dozens of gun bills in draft mode right now, addressing numerous issues that need to be fixed in the Iowa code. Of course, at the top of our list are Stand-Your-Ground law and Constitutional Carry. We’re all aware of the horrible mistreatment that fellow gun owner Jay Lewis suffered at the hands of the Polk Co. Attorney, John Sarcone, when he used his firearm to stop an attack from two violent criminals. Lewis, who was finally found ‘Not Guilty’ by his peers after serving 112 days in jail, emerged from jail destitute. He lost his job and his apartment complex booted him out, and dumped all of his belongings on the street while he sat in jail, unable to pay the bond. Jay got back on his feet with a tremendous amount of help from IGO members — but no gun owner should have to go through that. Ever! That’s why Stand-Your-Ground law continues to be a major priority at the Capitol. The good news is that the bill is about to emerge from drafting and will be available for your legislators to cosponsor shortly! 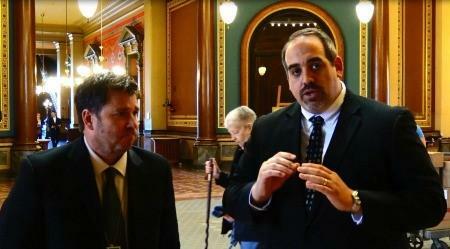 To hear more about where we are right now, check out this video, shot in the Capitol today with myself and Senator Rick Bertrand. But this is no time to relax! If anything, we need to get ready for a major grassroots effort here in the coming weeks. Some legislators are getting back into that comfortable mindset that takes place once they are back in office and two or four years away from their next re-election. You and I can’t allow the Second Amendment to languish as a back burner issue! We’ve worked way too hard to get where we are today. Just because we have pro-gun majorities, doesn’t mean that all of our problems are solved — they still have to actively pass this legislation! That’s why we’ll be letting you know when the bills are ready to be co-sponsored, so you can make sure your legislators know that you want their name on these bills. Now is the time to make the Second Amendment a priority! Stand-Your-Ground law and Constitutional Carry are the big issues that we want to see addressed, amongst others. Please support this legislation by co-sponsoring them, voting for them in committee, and pushing to make sure they come to the Floor for a full vote! To find out who your legislators are, click here. To call your Representative, you can use the House Switchboard which is 515-281-3221. To call your Senator, you can use the Senate Switchboard which is 515-281-3371. The receptionists can take a message for you or connect you with your legislators automatically. To find your legislator’s email address, you can go here for your Representative or here for your Senator. Of course, more often than not, your legislators are on Facebook and you can reach them that way, too. Since most of them are gone for the rest of the week, email and Facebook may be your best option. Get ready for a major push on these bills, it’s coming soon! P.S. In the coming days, we’ll have legislation for Stand-Your-Ground and Constitutional Carry ready for your legislator’s co-sponsorship. In the meantime, check out the video below, shot in the Capitol today, discussing the status of Second Amendment legislation in Des Moines. Please make sure you’re calling, emailing, and messaging your legislators on Facebook using the contact information we listed off above, and make sure they know you want them to deliver these bills this year! It’s not enough to have a pro-gun majority — we need to see these bills pass into law. Now is the time!